Living in South Africa, wondering if there was any hope for us, my moment of realization dawned. There I was, just 16 years of age, about to be attacked by a solider. Yet I felt peaceful as I looked up into his eyes. He lowered his weapon and stormed off, as I dragged an injured student to a nearby laboratory in the chaotic university grounds. Following that horrendous day, the medical department at the campus shut down..and so did my hopes for being a doctor in Africa. But little did I know that my nomadic adventure had begun. I’ve lived solo in 6 countries and +26 cities and been witnessing the state our world is heading towards. What I know for sure is that the only hope for a better future for all Beings is within the youth of today. In addition to my medical device Post Doctorate (USA), natural wellness expertise, my graduate training and experience teaching kids with multiple disabilities (physical, mental and emotional) and teaching youth from school age to post-graduate, has provided even more insights into the issues of youth. Since 2004, I’ve been using all my personal monies to support youngsters to boost their self identity and be better humans. The Super Conscious Humanity youth empowerment motivation program continues to be fully funded by me without any red tape. Along the way I learned a lot about the hopes and wishes of over 100,000 of today’s youth. I also learned that many youth are themselves feeling alienated, feeling helpless, feeling rejected and unknowingly seek comfort through inappropriate means: alcohol, smokes, sexual exploits, drugs, fame-glory, violence, manipulation, joining gangs, revenge and even engaging in acts of terror. All this is done without them realizing that they are only worsening their own future by weakening the gift within them. There are many groups out there that flourish on attracting our unhappy youth. These groups thrive on the vulnerable minds of our disenchanted youth. The groups find it easy to sway our helpless youth to become less than compassionate humans, in exchange for group identity and acceptance. Mass shootings and suicidal acts of terror by unloved youth are becoming the norm, just as much as alcoholism, drug addiction, criminal behavior, bullying, teenage pregnancy, thug mentality and false identity are on the rise. Each of these acts ruin the life of the youth who engage in these actions. Radicalization (radicalisation) is the worst possible route for anyone to take. It is an extreme lifestyle on the darkest side of the moon. Dear youth, radicalization (radicalisation) results in losing your own human powers that you are coded with. If you go this path you will eventually lose control over your own mind. You will become a follower. What should you do instead? Access your innate super consciousness and travel the route of self-empowerment and self development. Optimize your true human potential that is yours to keep forever. Why? Because with your own super conscious power, you will feel amazing even if you are on your own. You will be able to lead your Self. You will find people wishing that they could also feel like you. You live courageously, successfully, and compassionately. You will realize that you can make a difference and be the greatest asset to Planet Earth. Dear adults: As grown adults, it is our duty, especially if we are parents, grandparents, relatives, educators, care givers or leaders, to guide the children under our care, so that they realize the greatness within them….their full human potential. What is a great human? One who is kind, compassionate and sees himself/herself as one with everyone and all of nature. He/she is not restricted by education, religion, family status they are born into, or the job title that they have or the color of their skin, their gender or their cultural group. They see no boundaries because they are visionaries. Their mindset is expansive and integrative. They are fully aligned as intelligent humans on Planet Earth, fully aware of their humanity and super conscious powers to be visionary beings without being dragged down by the limitations of the six senses. When life throws a super conscious human challenges, he/she takes it on as an opportunity to dive deeper into him/her self to access the very best of him/her self so he/she can evolve to even greater heights. WHERE DO YOU START WITH BEING A SUPER CONSCIOUS HUMAN? Being a great human begins with children. I am a single woman, and I don’t have my own kids, but I mentor thousands of kids wherever I go around our Planet. For many years I’ve been living a simple life so that youngsters can better the world. Do watch the videos from the Dr. Vie youth empowerment motivation program PEACE Shows and see for yourself that we can have a better world if our young ones are guided well. WHAT CAN YOU DO RIGHT AWAY TO PREVENT NEGATIVITY IN YOUR HOMES, COMMUNITIES, NATIONS? You must start right away. There is not a moment to lose. Enough time has been lost already. I have seen the steady rise in youth issues since I started the program in 2004. Parents are losing their bonds with their kids, leaders are losing their bonds with communities because of distractions and insufficient knowledge. Right away, do encourage your youth to join my youth motivation live shows, interact, ask questions during the events. Please also join my special live events for adults to learn how you can be actively involved in guiding youth to be the fully realized humans that they are. We also have local events in many countries to bring the youth together to discuss world issues and how they can shape a better world by firstly loving who they are and accessing their super consciousness. 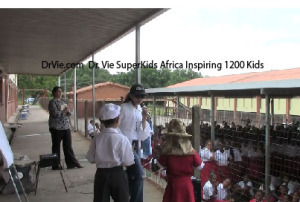 For now, to see videos scroll further down this page or to see even more, click here https://drvie.com/dr-vie-tv/ and get updates of events by connecting with me on Twitter and Facebook. If your youngster is interested in joining do contact me. If you have a youth organization that is interested in providing global support for their youth, do let me know. If you have any questions do send me email. I look forward to meeting you (if you are a youth) or meeting your youth soon. A free program for kids and youth, personally funded by Dr. Vie (V) since 2004, for the future of the Planet Earth and the great Cosmos. 2012 was a special year dedicated to the memory of Dr. Vie’s South African athlete, Carla Swart, who was part of the Vera Bradley USA team which Dr. Vie supported. Carla was 23 years old and had a special message for the world. Story books to promote compassion and love in youth and all ages. All proceeds fund my Super Conscious Humanity Program for Youth. How To Join Dr. Vie Global Youth Program for Youth Motivation? If you are younger than 26 years of age and want to apply please send us an email. After age 26 you are invited to join our adult Super Conscious Humanity Program, so you always feel connected. *Our youth have won numerous medals around the globe including the bronze medal at the London 2012 Olympics, when women were allowed for the first time to compete in track cycling. Three of our youngsters became Olympians. Our kids in South Africa are focused on restoring peace to the world. IF you would like to be a mentor in our program please do contact us. Do share the love by liking us above and sharing this page and subscribing to our Youtube channel below. Continue to spread the Word !